I absolutely love decorating my home with portraits and pictures of my family. Yes, I’m addicted to Rodney White, but besides his art, I prefer framed portraits to any other art in my home. 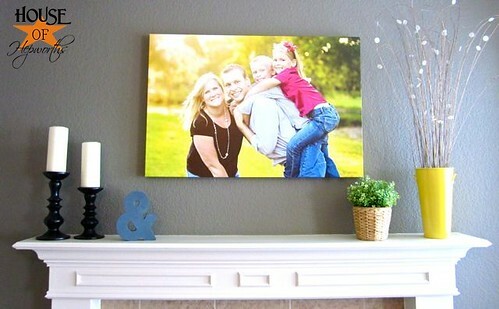 My favorite family portrait in our home is this huge one on canvas that I had printed up last year. It was above the fireplace for awhile, but now I have it hanging at the top of the stairs. 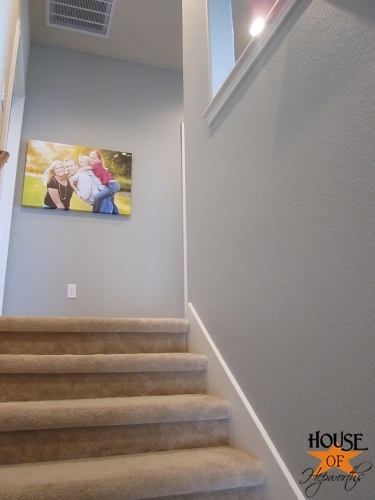 When you look up the stairs you are greeted by this large canvas. Love it. 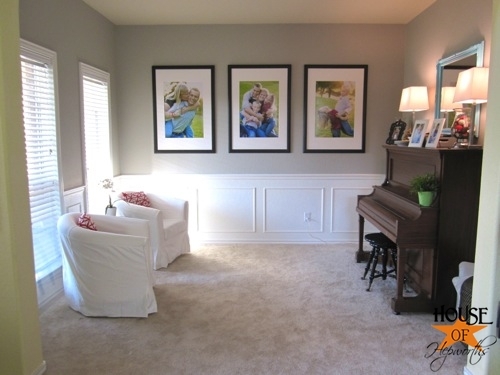 My most recent addition to our home are these huge portrait prints that I showed you last week. We are totally NOT a formal family, so I broke up the traditional formal-ness of the room by adding playful portraits. 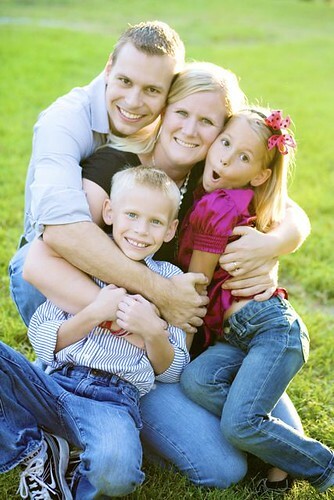 I intentionally selected a portrait of just Ben and me, then a portrait of our family, then one of just the children. 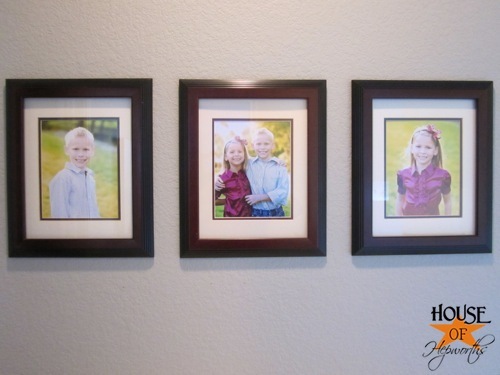 Also, when displaying portraits, it looks better to try to have the people facing towards the center of the wall. That is why I put the one of Ben and I on the left (we are facing right) and the one of the kids on the right (Travis is facing to the left). I go crazy when I see portraits displayed and the people in them are facing away from the center of the room. 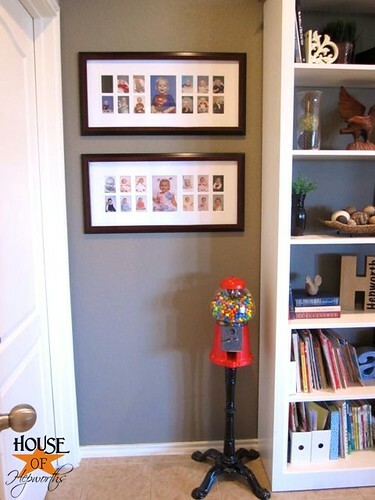 Sometimes it’s unavoidable, but if you can arrange your pictures towards the center, it looks better and more cohesive. The middle one is hard to see, so here is what it looks like. I chose it because of Kinsey’s expression. So funny. 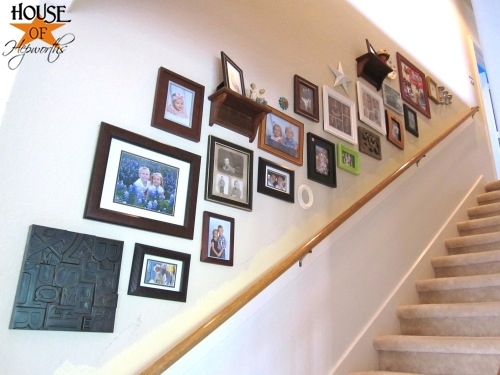 When you walk up our stairs you are bombarded with a gallery wall of pictures of my family. As you know, I’m elbow deep in spray paint while I update the frames on this wall. It’s #20 my to-do list, so hopefully I’ll finish the update soon. I love these people more than anything else in this world, and one way I show that is by plastering my home with pictures of them. Seeing their faces all over the house makes me smile. At the top of our stairs are yearly portraits of my children. I always have a current picture of each of them on display and another of them together. I’ve used these same frames for years and just swap out the newer photos as they get older. I had this picture of Kinsey taken when she was about 3. It’s one of my most favorite pictures of her ever, so I still keep it out on display. I also have this custom artwork of Kinsey that I just love. Modern Bird Studios did this piece for me as a gift. One of the things I did with my children during their first year of life was to get monthly portraits. It was one of the best things I’ve ever done and I’m forever grateful that I took the time to do it. I framed all their monthly pictures in these large frames I found at Costco, and it’s so cool to see their transformation over the course of their first year. I want to surround myself with things I love in my home, and what I love the most are my husband and kids. Pictures of my family bring a smile to my face more than any other artwork or decor. 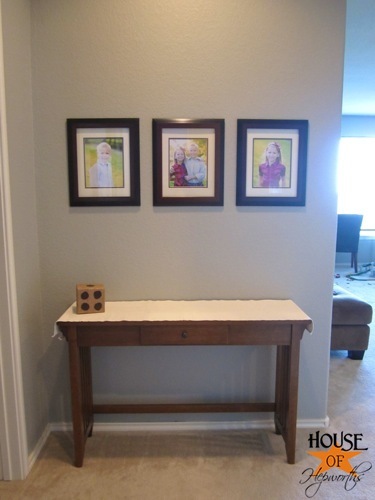 Do you have pictures of your family around your abode? 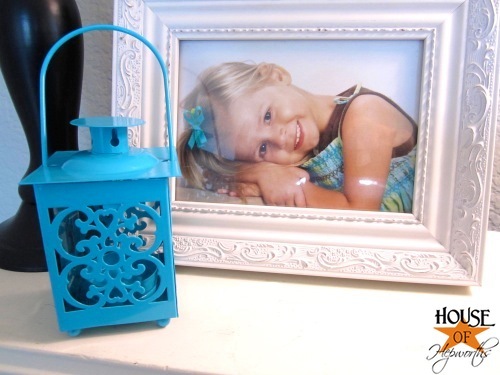 What are some reasons that you like to display your loved ones? 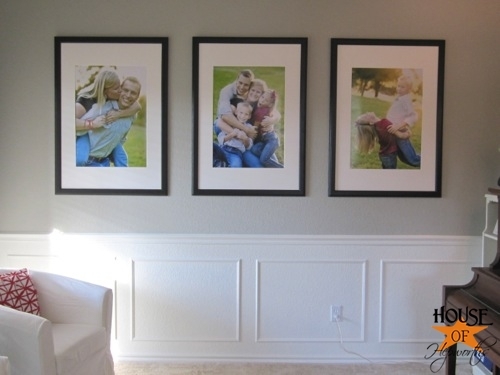 I love the use of family portraits in your home. We have a collection of family pictures at the top of our stairs. I love it because they are what you see as you climb the stairs and can also be seen from the front door. It’s my favorite! Lovely, Allison! Love this!!! Your photos – and family!! – are gorgeous! I love your pictures all around the house! I usually think people hang way too small of prints or dont map them out well, but yours all look great! We are the same way! Unless it’s a piece made by someone we know or one of our favorite artists, it’s a portrait. Love all your pics. I am working on a gallery wall in my kitchen, but have always been held back by the framing. Do I want them to all be the same, none the same, what color…. 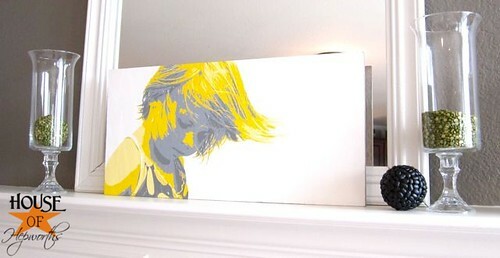 Then I saw a tutorial for Mod Podging pictures onto canvas. It is perfect for me. They are lightweight so I can just use the 3M strips to hang them which is awesome for us because we are renters AND this house isn’t drywall it’s plaster. I get the pic printed off @ Walmart and pick up the canvases at Hobby Lobby. Super Cheap. Thanks for the tips for placement, I have a stack on the table waiting to go on the wall today!